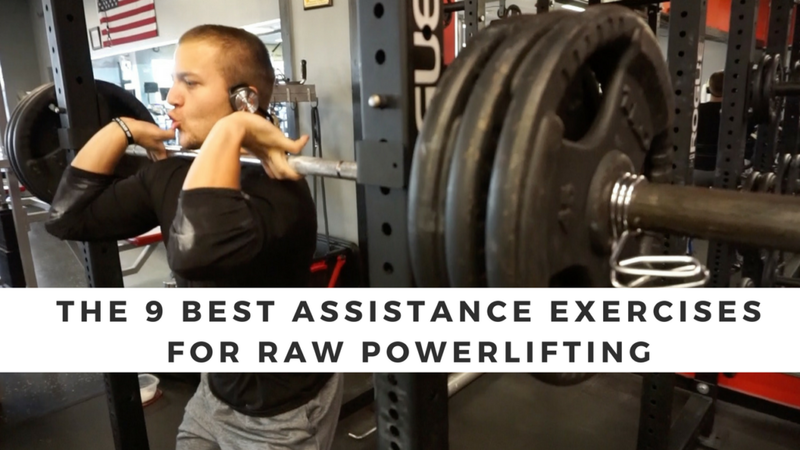 When you pose the question, “what are the best assistance exercises for raw powerlifting?” the options are nearly endless. There are many quality movements that can help improve a powerlifting total. The answer you ultimately receive will largely depend upon the “camp” the person you asked belongs to. Does the exercise involve bands and chains, a partial range of motion or a unique variation of the lift? Regardless, any list of top assistance exercises will have to address the question in a general sense. The best assistance exercises for me, with my specific weaknesses, might not be the best for you. With that being said, a general list like this probably covers 90% of everything you need to work on as a raw powerlifter. Most people do too much assistance work. I call this, “majoring in your minor”. Do not spend more time and effort on your assistance work than you do the main lifts. That is completely backward. In a perfect world, we would all be able to do as many assistance exercises for as many sets and reps as we can count. The problem is, in the real world none of us has the time or recovery ability to do that. While keeping that in mind, we have to understand the concept of training economy. The best exercises are going to be the ones that provide the most bang for our lifting buck. It’s important to understand the purpose of assistance work is to complement the main lifts, not take away from it. Every lift should have a definite reason behind it. Before we get into the list, I wanted to point out why I added the word “raw” into the title. I know some would argue powerlifting is powerlifting, but I would caution against that way of thinking. The assistance movements that work for equipped powerlifting are not going to be the same ones that provide the greatest benefit for raw powerlifting. The truth is some of the exercises popularized throughout the powerlifting world are not very effective for the raw lifter. The pause squat might be the most effective squat variation for raw powerlifting. The key is doing the movement correctly. Depending on what your ultimate goal is for the exercise, the pause can come at a few different spots. The most popular spot to pause (and the spot I recommend) is at the bottom, just below parallel. Another option would be to use the pause to address a specific weak area. For that purpose, you would place the pause at the specific joint angle that you are weak. For the purpose of this article, let’s assume you are doing the exercise in the general sense and pausing in the hole. The biggest mistake I see people make is turning the lift into a slow eccentric tempo squat. Tempo squats are great, but not what we are trying to do with a pause squat. Descend at the same speed you normally do and make a hard stop at the bottom. Once you hit the spot you want to pause, avoid bouncing or relaxing as that defeats the purpose of the movement. If done correctly, the pause squat will help you maintain tightness and stability out of the hole. Lastly, I recommend recording yourself on video to stay honest with the pauses. Aim for a 1–4 second pause depending on what your goal/programming is. It’s pretty easy to think you are pausing longer than you actually are. Don’t cheat yourself. The camera never lies. When you walk into a gym and see someone front squatting heavy, you know they take their training seriously! The front squat is tough and uncomfortable but highly effective. Some of the best pound for pound squatters in the world come out of the Olympic lifting community and the front squat is their bread and butter. The front-loaded position forces you to maintain an upright posture and limit forward lean. 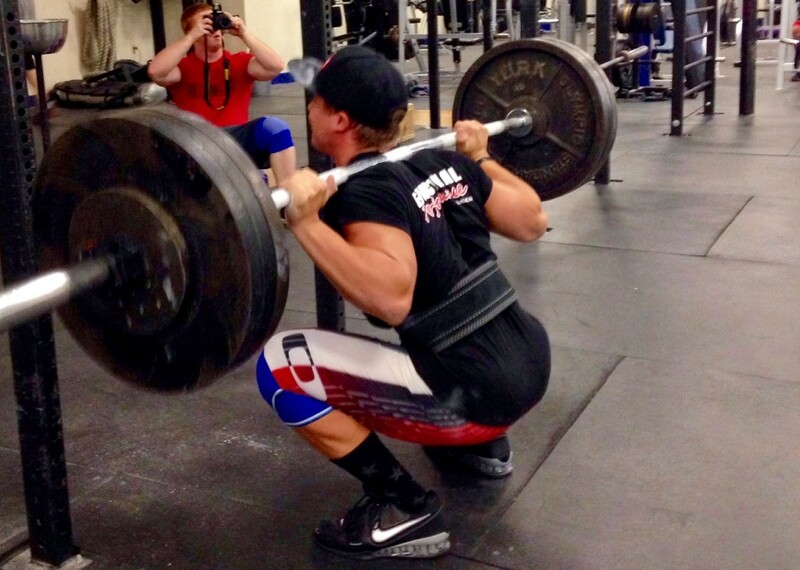 It’s almost impossible to “muscle” through a bad position in the front squat. The upright nature of the movement puts a greater emphasis on the quadriceps with less on the hamstrings and lower back. As powerlifters, we love to focus on the posterior chain, which is important, but quad strength is just as important (if not more) to a raw lifter. The core and upper back strength required in the front squat is unmatched! Obviously, increased upper back and core strength will carry over into every movement, not just the back squat. 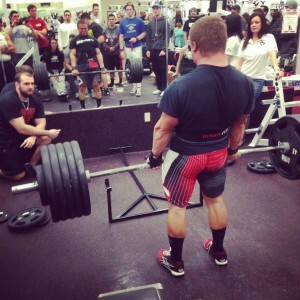 The grip tends to be a limiting factor for most powerlifters. the front rack position is ideal, but if you can’t get the positioning right or lack the mobility, a cross-armed “bodybuilding” grip will be sufficient. You can also flip a safety squat bar around and do front squats that way as well. Don’t let the small detail of grip keep you away from doing a quality movement. Note- if you are a low bar squatter you can get similar benefits just by adding in high bar, although I still recommend using front squats. I had a lot of options for this third exercise, but ultimately I went with the one exercise most people neglect. The main reason why I added this exercise to the list is the unilateral nature of it. Most powerlifters, myself included, neglect unilateral work. That is a mistake. While you definitely want to spend the majority of your time on bilateral barbell movements, the occasional unilateral exercise can be very beneficial. The split squat will work on imbalances that you might not have even realized you have! Another added benefit includes reduced lower back stress due to less compression spinal loading. Remember what I said in the beginning, it’s important for the assistance work to enhance the main lifts, not take away from them. While specificity is important, staying healthy is important as well. Leave the ego at the door. They don’t hand out gold medals to the Bulgarian split squat world champion. Quality movement is far more important with this exercise. Nothing is more movement specific than the close grip bench press. Just a slight difference in grip width can make a substantial difference. The CGBP is the gold standard for triceps development and more so lockout strength. One of the goals of a competition bench press is to make every attempt possible to shorten the range of motion — wider grip, bigger arch, etc. This is how you lift the most weight possible. However, a shorter range of motion can limit the training effect. Another sneaky benefit of the CGBP is the closer grip increases the range of motion of the exercise and therefore time under tension. Don’t take the name overly literal and grip the bar too close. Grab the bar right around shoulder width plus or minus a few inches depending on what’s comfortable. There is no sense in hurting your wrist and potentially your shoulders for a closer grip than necessary. The Spoto Press is a bench press where you stop the movement short and pause the bar an inch or two off the chest. Essentially this looks like a gym bro cutting his range of motion short to make it easier. Trust me, the little detail of pausing the bar makes all the difference in the world. What sets the Spoto Press apart is the isometric component of the movement. Just like with the pause squat, make sure you do not slow down the eccentric part of the lift. Lower the bar with the same speed and come to a hard stop about an inch off the chest. Pause for a full second and finish the movement. You can pause at different spots depending on your sticking point, however, about an inch off the chest is most effective. A common issue people have is losing tightness right off the chest; this causes the bar to accelerate in the bottom part of the lift. Not only can this lead to shoulder issues, but it can also cause you to mis-groove the rep. Keeping the bar off your chest forces you to maintain complete control of the bar. These build a tremendous amount of reversal strength and improve stability off the chest. Spending more time in the area where you lack stability is going to help you improve it. I call this exercise “the truth”. Similarly to the Bulgarian split squat, I added this exercise to the list because of its unilateral nature. If you have any imbalances or stability issues this exercise will bring it to your attention. Using one arm at a time is very different than doing both arms at the same time. Besides the added core aspect (you have been warned) using one arm at a time requires unique full body tension. I like to use this as a coaching tool to help client’s transition that tightness over to the barbell bench. With the one arm press you have to maintain tightness, failure to do so will result in you flying off the bench! This movement is also great if your shoulders are feeling banged up from all of the barbell work. Similarly to the pause squat, the pause deadlift is probably the most effective deadlift variation. It’s simple, but definitely not easy! I like this exercise because it is very effective at reinforcing a good starting position as well as a quality overall movement pattern. It’s almost impossible to pause a heavy weight in a bad position. Adding in the pause allows you to find the most efficient line from point A to point B. The more efficient you are, the stronger you will be. The exercise helps train people to better engage their lats which prevents the bar getting away from the body. A lot of people also have trouble bracing their core when deadlifting. The pause deadlift helps address that. Pause in the spot you are weak, for most people that is going to be right off the floor or at lockout. If you want to be really fancy you can even pause in both spots, but that’s a topic for another article. Try not to let the bar move towards the floor after the pause. This is important. Stay tight and in control of the bar throughout the entire range of motion. An added bonus, the pause deadlift is a great grip strength builder. The act of holding the bar in position for a greater time under tension, plus getting the bar moving again really taxes the grip. Of course, this is only applicable if you don’t wear straps. Although they are typically used interchangeably, there is actually a difference between the Romanian Deadlift and the Stiff Leg Deadlift. The difference is not that significant but it is worth noting. The biggest difference comes in the start position. The RDL starts from a rack, in the “hang” position whereas a stiff leg deadlift starts from the floor. An SLDL really just looks like a poorly executed regular deadlift — hips high, bar out in front of the body with a full range of motion. The RDL, on the other hand, starts up top and the bar only descends to mid shin. I love the Romanian deadlift. They are by far my favorite deadlift variation. Actually, I like the RDL significantly more than even the traditional deadlift. The RDL reinforces the hip hinge movement pattern without beating you up as much. As previously mentioned, I don’t want my assistance movements to take away from the main movement. Deadlifts are very taxing. The limited range of motion allows you to put greater emphasis on the hamstrings while preserving the low back. The key is to only use the range of motion you have the mobility for. It’s very easy to extend the range of motion and allow your lower back to round. Don’t be afraid to go heavy with these, this is still a movement you can push the load with. Last but not least, the deficit deadlift. This exercise is specifically designed to help improve strength off the floor. I will admit I don’t use this movement as much as I have in the past. It’s the only exercise on the list that I don’t feel is a great exercise for myself, personally. My short, T-Rex arms make it difficult for me to get set up in a good position on a deficit. If you can’t get into a good position at a deficit due to your limb lengths or lack of mobility, this exercise is not for you. With that being said, I do feel the deficit deadlift is a good exercise for most people. The key is keeping the deficit small so there is more transfer over to the regular deadlift. There is no reason to use an excessively high deficit, which requires a completely different movement pattern.